Cigarette smell is pungent and nauseating that it’s so unbearable to deal with. Most of the non-smokers would agree with my opinion. Whether you have a smoking member or a visitor just dropped by, once you find them smoking, you immediately grab the air freshener to deodorize the house. So, to deal with the intolerable and captive situation, you need to take some effective measures to get the smoke smell out of your house. Getting rid of smoking smell takes a lot of effort. It’s really a hectic job for the ones who are living with a smoking person. Thus, to save your indoor air and ensure a healthy environment for the family members, here we give you some effective tips that will help you remove smoke smell completely. When someone smokes at your house, the first and foremost task you should do is ventilation. Open the doors and windows to let the fresh air get in. As soon as the fresh air enters your house, the pungent smoke smell will remove. This step will also ensure fresh air circulation in the indoor atmosphere. To ensure the ventilation faster on the, you can place a fan at the entrance door of the particular smoking room. Then, run the fan on maximum speed facing inward. You need to close all the doors and windows of that room and keep open only one. Let this process stay for 15-20 minutes. The fan will evacuate the smoke smell through the window. In this way, you will be able to remove the smoke odor faster. This step is important to ensure more oxygen and breathable air to let in the house. When someone smokes, we can feel the smell. The smoke particles are so tiny that we cannot see in naked eyes. But, they get stuck on the wall, fabric, clothes and more importantly float in the air. If smoked regularly, you definitely get the unpleasant smell from the clothes, bed and any fabric. Thus, the house needs to be deep cleaned to get rid of the smoke smell and particles completely. without cleaning you cannot completely ensure the house. For cleaning purpose, you can purchase a cleaning product or follow home remedies. Mix 8 parts warm water with 1-part borax or sodium borate in a bucket. Now, take a sponge to dip in the solution and rub the hard surfaces like wall and floor. Sprinkle some baking soda on the fabric materials such as sofa, carpet, curtain, and bed. Let the soda stay for a while and then use a steam cleaner or vacuum cleaner to deeply clean the furniture. With the above-mentioned process, your house will be smoke-free. But, if the house has a long history of smoking for years, it will smell from the paint as well. With the home remedies, it won’t be perfectly removed. Thus, if you move to a new house where you can get the toxic smoking smell, we would suggest you repaint it. Remember to follow the below steps to save your house paint from the further smoking smell. At first, clean the wall with glycol or ammonia-based cleaning products. These two ingredients help to neutralize the surfaces. After cleaning, rinse the surfaces with water. Let the wall dry. Before beginning to paint, use a primer on the wall. Primer helps to prevent smoke smell from getting stuck on the wall. Now, begin to paint with your desired color. We suggest you use latex paint so that you can easily clean the walls next time and minimize the need to repaint again. If you are fond of natural ways to deal with smoke problems, the above-mentioned measures will be able to give you the desired outcome. But, if you buy an air purifier, it will help to perfectly remove smoke odor immediately whenever someone smokes. Moreover, some air purifiers can effectively remove smoke and airborne particles too and ensure breathable fresh indoor air. It doesn’t mean an air purifier is a replacement for a cleaner. But, it will surely minimize the need for frequent cleaning maintenance of your house. Eventually, it will also help to reduce the opportunity of asthma, allergies and breathing problems. However, you need to purchase the ideal air purifier for the smoke with the right size and efficiency. 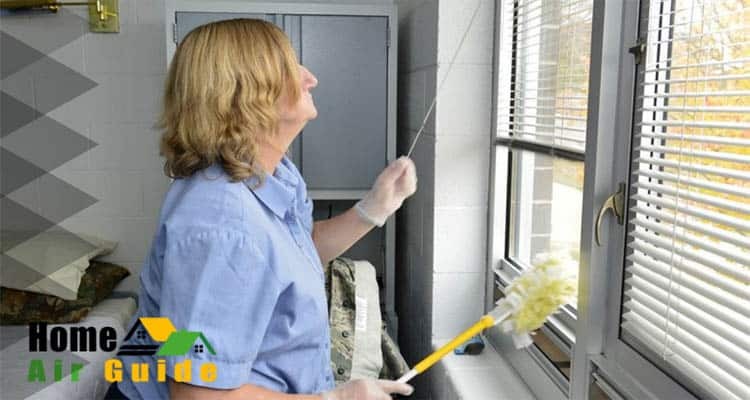 Even though it takes a lot of energy and time to remove smoke odor from the house, all of the suggested measures are effective to do the job. Each and every measure have been tried and tested on different houses and turned to be working successfully. They will work in your house too. Thus, we insist you follow the procedure of ventilating, deep cleaning and purifying the air thoroughly your house on a regular basis. It will not only remove the toxic nicotine odor but also remove smoke particles from the atmosphere. So, try out today and let us know your experience!